Product prices and availability are accurate as of 2019-04-06 15:38:57 EDT and are subject to change. Any price and availability information displayed on http://www.amazon.com/ at the time of purchase will apply to the purchase of this product. 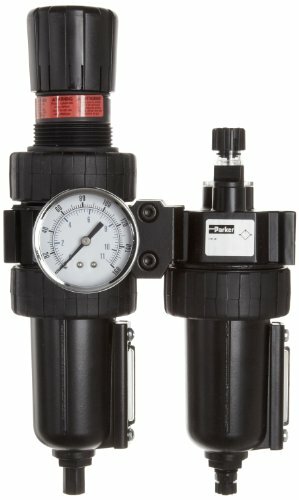 This Parker 06H compact series two-unit combination compressed air filter/regulator/lubricator (FRL) is for decontamination and air preparation in a compressed air system. 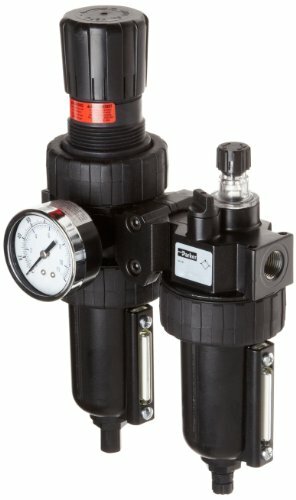 This two-unit module combines a filter, regulator, and lubricator (FRL) for space-saving installations. This unit has a bowl that can be filled while the air line is under pressure, preventing downtime in the system, and its proportional oil delivery permits a wide range of air flow possibilities. The regulator can be mounted with the knob in the up or down position to suit specific installation requirements, and it has male National Pipe Taper (NPT) threads for connecting to female threaded pipes. This filter is suitable for use in manufacturing and automated production environments. Compressed air filters remove pollutants and submicronic contaminants from clean air in compressed air handling and preparation systems. Clean compressed air provides and controls energy, conveys materials, and is critical to the safe operation of equipment in many industries. Compressed air filters remove particulates (dirt), oil, water, and oil vapor. They can be combined with other units, integrating with either a regulator, which controls excess pressure for better performance, or a lubricator, which adds oil mist to the air, or both. They are typically constructed of metal, such as zinc or type 316 stainless steel, or transparent polycarbonate, and are available with optional indicators, gauges, and drain configurations depending on the application. Compressed air filters are used in a wide range of applications, including food processing, electronics, health care, and instrumentation, among others. Parker Hannifin manufactures electromechanical, hydraulic, and pneumatic motion technologies and systems. The company, founded in 1918 and headquartered in Cleveland, OH, provides fluid handling, filtration, sealing and shielding, climate control, process control, and aerospace technologies.